 The author of The Little Girl Book (not reviewed) attempts in his adoring study to view eight American authors' lives and works in the context of their major literary friendships. Stating that his object is to explore ``epiphanic moments'' in the friendships of four pairs of writers, Laskin begins with Herman Melville and Nathaniel Hawthorne, ``primordial gods, titans'' who shared a relationship that is, in this book, no less than archetypal. Beneath the cloying hero worship it's possible to discern a pair of talented but very human beings, with Hawthorne shrinking somewhat from the emotional heartiness of Melville's high regard. Similarly Edith Wharton, possessed of considerable wealth and commercial success, bowled over a somewhat jealous Henry James emotionally just as she swept him up in her fast, newfangled motorcars. Before their professional relationship blossomed into a personal one, Katherine Anne Porter promoted Eudora Welty's career but was not above feeling a twinge of jealousy at Welty's success with Delta Wedding while she struggled to produce Ship of Fools. Restrained Elizabeth Bishop and explosive Robert Lowell are depicted finding an uneasy common ground that is reflected in their poetry. 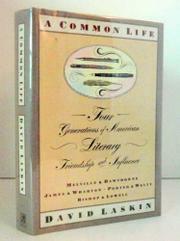 Although these writers and their friendships are inherently interesting, Laskin treats his subjects as little more than celebrities, reading their works like tabloids to find clues to their lives (a technique that James pokes fun at in his story ``The Figure in the Carpet''). The worst moments are such random leaps into the bizarre as the author's speculation that Lowell, who died suddenly, might have ``interceded for Bishop from beyond the grave'' (because she died the same way) or his observation that Lowell's ongoing struggle with mental illness somehow marked him as a poet--Laskin's naivetÇ is cringe-inducing. A pedestrian effort that says little new or enlightening about these literary lives or the nature of friendship.